Lot's of enjoying these few days as it's probably the only holidays we've got (if we consider working not holiday)! So tomorrow's the big day! Heading off to TIOMAN ISLAND! For a 4 day, 3 night trip - with snorkeling, trekking and lots of fun! Can't wait for tomorrow! I actually have to be in school by 6.30am, so I've to wake up at 5 (lucky my dad's fetching) and it's already 12 now! I have to wake up in 5 hours and I'm not even asleep yet! Yikes! Can't possibly update so much stuff over the so many days I didn't post, so I'll skip right to the main point! YEP! That's prolly pretty much everything thats on my mind now! 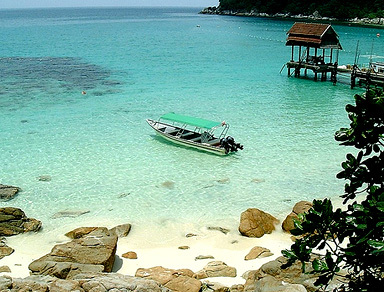 The clear waters and sandy beaches of Tioman island! It's gonna be so much fun! I'll write about it when I'm back!! !